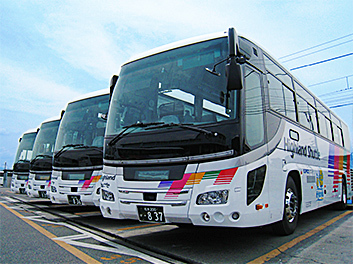 Direct bus service from and to HANEDA/NARITA AIRPORT AND HAKUBA, NAGANO｜Alpico Kotsu Co., Ltd. DIRECT BUS FROM AND TO HAKUBA, NAGANO operated by ALPICO KOTSU CO., LTD.
We always assist your splendid travels. This direct bus is operated by "ALPICO Kotsu", a largest local bus company in Nagano Prefecture. ALPICO Kotsu has a history of 93 years. We have oriented passenger's safety and comfortableness. Please pay attention to our striking 5 color stripes bus for boarding. © Alpico Kotsu Co., Ltd. All Rights Reserved.